Actually, it's about ethics in legacy superhero identities. With his amazing technology, Eric O'Grady shrinks to become the half-inch superhero Ant-Man! Hmm, almost. It's not "his" technology, it's Hank Pym's (technically Criti Noll's, the Skrull who was impersonating Pym at the time). Skrull-Hank was working on a prototype "G.I. Ant-Man" suit for the military, when Hydra attacked. The Helicarrier his lab was on crashed, because that's what Helicarriers do, and O'Grady (a SHIELD surveillance agent) stole the suit so he could live. And stalk women. Mainly stalk women. The most famous thing he ever did was spy on Carol Danvers in the shower. Anyway, he was enrolled in the Initiative, then the Thunderbolts, then for some reason Steve Rogers asked him to be on the Secret Avengers. And he was a Grade-A creep through it all. Apparently Steve's trust was not mis-founded, because O'Grady did actually start to act somewhat heroic. While trying to defend a young boy, he was killed by a group of nobody villains. They replaced him with a Life Model Decoy to infiltrate the Avengers, and that's what this figure represents. The biggest clue is his helmet - it's a new mold, shaped a lot like the classic Ant-Man helmet, but a bit wider, with bent antennae, a sculpted line over the top, and four additional "eyes" on the forehead. When he wore this costume, Eric O'Grady (or at least, his magical robot clone) went by the name "Black Ant," so the color of his costume suits that. It basically reverses the colors of Pym's first suit: instead of a red suit with dark gloves and boots and a black symbol on the chest, it's a black suit with red. The upper edges of the boots and gloves even have the pointed edges Hank used to wear! The helmet is black with orange highlights, which looks very sinister. You'll want to compare, to make sure the helmet is painted crisply. Other than the head (and the belt, which is a separate piece), this figure is a repaint of the new Spider-Man body, and has all the attendant articulation: a balljointed head, hinged neck, lateral pec hinges, swivel/hinge shoulders, swivel biceps, double-hinged elbows, swivel/hinge wrists, a hinged torso, swivel waist, balljointed(?) hips, swivel thighs, double-hinged knees, and swivel/hinge rocker ankles. One of the pec hinges is stuck on mine, and I haven't figured out whether heat or cold is the trick to freeing it. 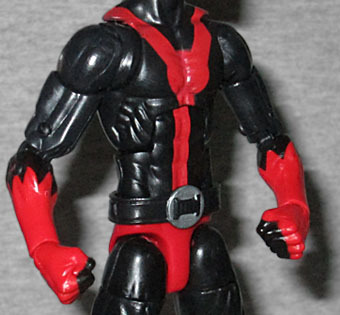 Black Ant doesn't have any accessories, or a BAF piece (the packaging unsurprisingly identifies him as part of the Ant-Man series, so it would be Ultron if he did have one). He could really use some little ant friends, but it's possible that Hasbro doesn't have any molded. Like Agent Venom before him, he's a Walgreen's exclusive; look for a display near the registers. The Walgreen's website will even tell you whether your local pharmacy is likely to have any in stock! 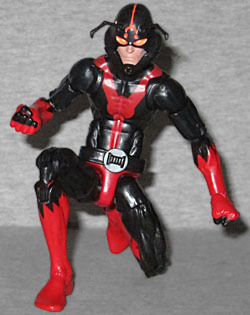 Black Ant is a nicely made action figure, and we now have Marvel Legends of Eric O'Grady, Scott Lang, and Hank Pym - all three men to ever use the Ant-Man identity.